Yellow Pond Lily, Do you open for thee? "An old pond / a frog tumbles in / the sound of water." — Basho. The third of three extracts from Alan Cvancara's new illustrated book, Wildflower Personalities. 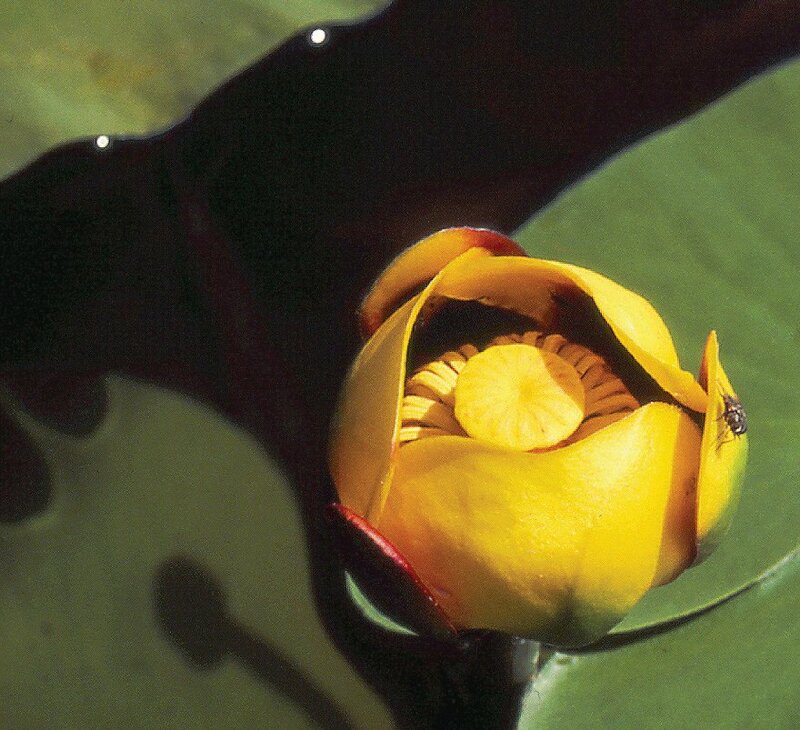 Yellow Pond Lily, Nuphar lutea, Water Lily. I first faced yellow pond lily one June in Yellowstone National Park’s tiny Isa Lake, near the Continental Divide east of Old Faithful. Stripped of boots and socks, I waded with eagerness for a close-up photograph of the globe-like blossom. I punched off several shots before pausing to peer into the water. Seeing several 6-inch leeches undulating toward me was enough call to scamper from the lake, and absorb the saffron beauty from a leech-less vantage. Great Egret in contemplation: What does she think about the yellow water lily? For Quick Recognition. Usually six petal-like sepals make up the most obvious parts of the yellow flowers, 2 to 4 inches across. These sepals, often tinged with green or red, partly conceal numerous stamen-like petals as do reddish-purple stamens. The stamens are not visible in the photograph. Capping the obscured petals and stamens is a yellow disk-like pistil. Egg-shaped to heart-shaped leaves float on the water’s surface. Where and When Found. 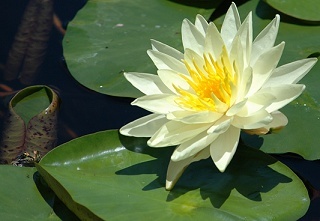 Look for yellow pond lily in ponds, at margins of lakes, and in quiet streams. It occurs from Alaska and the Northwest Territories south to British Columbia, east to Newfoundland, south to Maryland, and west to Idaho. This water lily blossoms during May to September.k. Of Note. Nuphar (NEW-far) lutea (lew-TEE-uh) also has been named Nuphar variegata (or variegatum) and Nuphar polysepalum. Nuphar is from the Arabic name for pond lily and lutea is from the Latin luteus, “golden yellow.” Other names for yellow pond lily are yellow water lily, Indian pond lily, bullhead lily, cow lily, and spatterdock. ALAN CVANCARA has nurtured a passion for wildflowers for more than 40 years. Cvancara is a retired geology professor and the author of 11 nature books: Edible Wild Plants and Herbs, A Field Manual for the Amateur Geologist, Sleuthing Fossils, Bare Bones Geology, Designs of Nature, Canoe Tripping and Life, Exploring Nature in Winter, Sleuthing Fossils, At the Water´s Edge and Showy Wildflowers of Casper and Muddy Mountains, Wyoming. He and his wife have co-authored Windows Into Legacy, a poetry-photography book. Cvancara is also an artistic photographer. 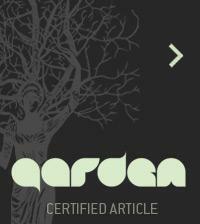 Buy Wildflower Personalities through Xlibris. Cover photo by Nancy Hill.